MiniArt continues to impress me with not only the quality of its figures, but the effective groupings that are ripe for stand-alone dioramas or as part of a larger setting. This one recalls an old Army Signal Corps photo that plainly contradicts the Nazi propaganda extolling its superhuman fighting men. While the poses of the standing figures are appropriately stiff, the medic aiding the wounded, anguished enemy soldier provides movement. The boyish Germans are not much younger than their captors. MiniArt's sculptor has captured their sullen expressionsas well as any I've seen in plastic and almost as good as some Hornet heads. The figures are sculpted and molded with the typical eye for detail MiniArt has demonstrated in the past. 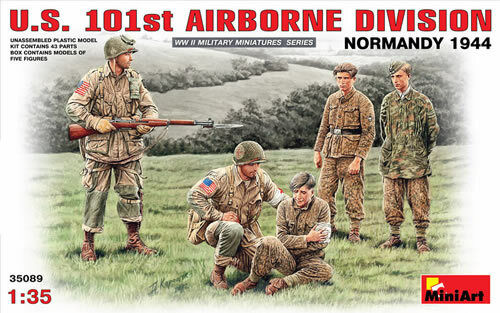 The paratroopers are correctly outfitted, including the spare bandage package tied to the suspenders. The medic's bags are accurately rendered. The cargo pockets for both figures are separate parts to give a more natural look than could be achieved. The bayonet is molded separately from the M1 Garand so you don't have to have it fixed on the weapon if you want a little difference in your pose. You will need to provide your own sling, however. The Germans also are well done in their rumpled late-war uniforms. The collar for the seated figure is separate so it will flare out. It's a devil painting that pea pattern camo but at least they have no weapons or gear to paint. Even if you are not a master at figure work, this set will give you a good foundation for an effective and evocative diorama. Review sample provided by MRC.